One way to refer to the various indigenous peoples of the Americas, especially those who reside on and off reservations in the U.S.. Pueblos indigenas, Aborigen, Amerindian, and Aboriginal peoples are also terms found in usage to refer to those groups indigenous to the Americas. Native Americans largely prefer to be referred to by their specific tribal name, however. Hillerman's fiction deals exclusively with Native American cultures located in the Southwest region of the U.S., especially the Navajo, but also the Hopi, Zuni, and other Pueblo groups. In most cases, Hillerman uses the word Indian when referring to members of these various cultures, only rarely writing "Native American." Believing, or hoping, that they had stumbled upon eastern shores of the subcontinent of India, fifteenth- and sixteenth-century European explorers called the local peoples they encountered "indios" (in Spanish) or Indians; the misnomer stuck, and is a vernacular connundrum that persists in the Americas through to the present. 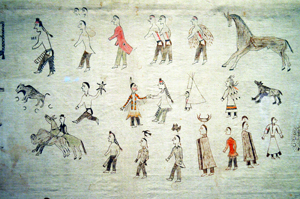 "Winter Count, on cotton cloth by Long Soldier, Oglala Lakota, circa 1798-1902, Smithsonian National Museum of the Native American," photograph by Tim Evanson. 2005 Native American Indian Studies: A Note on Names. Peter d'Errico's Law Page. http://people.umass.edu/derrico/, accessed March 10, 2010. 2004 Government Surnames and Legal Identities. National Identification Systems. Carl Watner, ed. Jefferson: McFarlanda & Co., Inc.